The Flamingo opened its doors in 1946, making it the oldest casino on the Strip and a true slice of Las Vegas history! It's an all-in-one resort, hotel, and casino that's true to its legendary hospitality AND its namesake birds. Many of the rooms are newly renovated and feature comfortable modern furnishings with splashes of the resort's signature hot pink. Rooms start at 350 square feet, with one king bed and one chaise lounge. Rollaway beds are available for an extra charge. The décor focuses on the sweet spot between modern and comfortable. Check-in time is 4:00 PM, check-out time is 11:00 AM. The Flamingo is conveniently situated in the Strip's center, nearby to Caesars Palace and The LINQ. It shares a monorail stop with Caesars Palace. It's also within easy walking distance of the Bellagio and Mirage, and offers free shuttle service to the Rio. This iconic Las Vegas centerpiece highlights the majestic, pink, you guessed it, flamingo! A flock of Chilean flamingos live in harmony with ducks, rescued pelicans, turtles, lovely koi fish, and more in this serene environment! Best of all, it's free to visit! Kids will enjoy watching the twice-daily feedings. The Wildlife Habitat is a great place to learn while enjoying a slice of nature's bounty. The Flamingo Wildlife Habitat is open daily from dawn to dusk. Feedings take place at 8:30 AM and 2:00 PM. Described as "Larry David in a dragon suit," British magician Piff the Magic Dragon brings his droll humor and award-winning magic to the Flamingo stage! His renowned illusion skills have been displayed at some of the world's most famous arenas like the O2 Arena in London and the Sydney Opera House. Piff and his Chihuahua sidekick Mr. Piffles cracked the UK in the mid 2000's; they first wowed the United States on "America's Got Talent," getting to the competition's Top Ten. Piff's show keeps you guessing, keeps you laughing, and will wow all ages! The Beach Club pool is 15 acres of lush tropical paradise! The pool is open to hotel guests only. Get ready to share space with the local flora and fauna in the nearby Wildlife Habitat, including yes, flamingos! Kids will love the waterslides and room to play. Towels are provided at the pool and cabanas are available for rent. The Beach Club Pool is open on a seasonal basis. This exciting Las Vegas attraction is the world's tallest observation wheel and the centerpiece of the LINQ Promenade. Measuring in at a staggering 550 feet tall, it takes the High Roller 30 minutes to complete a full revolution. The wheel houses passengers in climate-controlled glass pods that hold up to 40 people apiece. Beverages are available for purchase. The High Roller operates from 11:30 AM to 2:00 AM daily. Great for families with older kids! Get your thrill fix by speeding down the zipline between the tops of the Rio Hotel’s Masquerade and Ipanema towers. Two at a time, riders soar high and see Las Vegas as never before, at speeds of up to 33 miles per hour. Kids must be 48 inches tall to ride. The VooDoo Zipline is open daily from 11:00 AM to 11:00 PM. 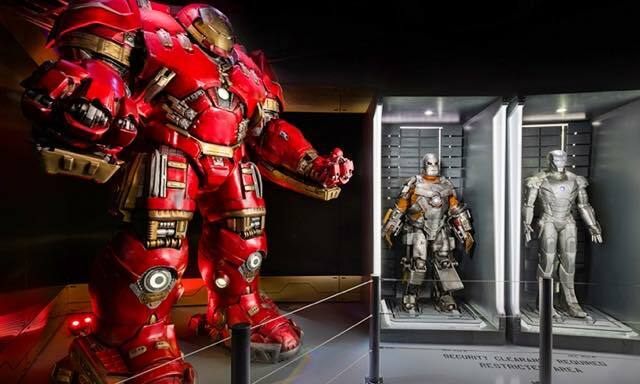 Whether your family loves comic books, the Marvel Cinematic Universe, or both, they’re sure to enjoy this incredible immersive exhibit. Get up close and personal with Iron Man, Captain America, Thor, and more as you work on a specialized mission from the Scientific Training And Tactical Intelligence Operative Network. A great way to mix education and imagination! Avengers S.T.A.T.I.O.N. is open daily from 10:00 AM to 7:00 PM. Get ready for a rockin’ good time with 18 holes of mini-golf surrounded by glow-in-the-dark special effects, video, KISS props, and of course a DJ playing all the band’s greatest hits. More than just mini golf, visitors can enjoy trivia, arcade games, a memorabilia museum, and a Rock Shop. KISS Mini Golf is open from 10:00 AM to 12:00 AM daily. Can't decide on one spot for a casual family lunch? No need to worry! The Flamingo Food Court is packed with budget-friendly options like Johnny Rocket, Pan Asian Express, Bonanno’s Pizzeria, and L.A. Subs & Salads. There's something for all tastes here, at prices that won't break the bank. The Flamingo Food Court is open 24 hours. This is a great spot for breakfast, brunch, and lunch. The floor-to-ceiling windows offer a relaxing view of the Flamingo Wildlife Habitat for a light and relaxing dining experience. The buffet stations specialize in American, Southern, Asian cuisine, and more, with new offerings like the made-to-order omelet bar and made-to-order crepe station! There's a fully-stocked salad bar for those interested in lighter fare, as well as a delicious array of desserts to satisfy the sweet tooth in every family. Buffet of Buffets passes are accepted here. The Paradise Garden Buffet is open 7:00 AM to 2:00 PM daily with special 5:00 PM to 10:00 PM hours on Friday and Saturday. This casual grill focuses on fresh Mexican flavors. The wide-ranging menu features everything from soup and salad to Mexican street corn and burrito bowls. This is a great option for a fun family night out with familiar treats like tacos, quesadillas and chimichangas for the kids and tasty frozen adult beverages for parents. Dine on the patio and enjoy a beautiful view of the Flamingo gardens! Carlos ‘n Charlie’s is now open for breakfast! Whether you’re in the mood for huevos rancheros or fluffy Belgian waffles, there’s something on the extended menu for everyone. Hours are 8:00 AM to 2:00 AM daily. Café Express is ideal for a quick bite any time of the day or night. Breakfast is served until 1 OM, along with a wide range of options like pizza, sandwiches, salads, and more. Try a classic Turkey Club or partake in some lighter fare like Greek yogurt and seasonal fruit. On the go? Grab your meal for takeaway and fuel up as you continue your Las Vegas adventure. Café Express is open 24 hours. The Flamingo does not offer on-sight childcare. We recommend contacting the concierge for information on arranging a childcare service. Guests can sign up free of charge for the Caesars Total Rewards Program upon their arrival. Earned and unexpired points can be used toward in-hotel purchases like meals and shows. The Flamingo charges a daily resort fee of $39.68 per room, which covers internet access, phone calls, and access to the fitness center. Summing up: Is The Flamingo Child-Friendly? The Flamingo’s renovation and renaissance has brought it into the modern era and cranked the family factor up! The resort still focuses heavily on gaming and there is a party atmosphere for those searching for it, but with exciting attractions like the Flamingo Wildlife Habitat and plenty of all-ages fun to be had, the Flamingo is a great choice for families looking to paint the town pink.